3Doç Dr., Sağlık Bilimleri Üniversitesi Ulucanlar Göz Eğitim ve Araştırma Hastanesi, Göz, Ankara, Türkiye Purpose: To evaluate the postoperative anatomical and functional success status, postoperative complications and their results of vitreoretinal surgery (VRC) with the preference of vitreon use as a vitreoretinal (VR) tamponade for inferior rhegmatogenous retinal detachment (RRD). Methods: Forty-three eyes of 43 patients were retrospectively evaluated. 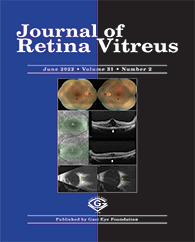 Patients’ etiology of retinal detachment, preoperative ocular diseases, best corrected visual acuity (BCVA), intraocular pressure (IOP) values, biomicroscopic features, detailed fundus examination findings, postoperative complications, anatomical and functional success results were evaluated. Results: Twenty six of the 43 cases were male (62,8%) and 17 were female (37,2%). The mean age of the cases was 50.8±18.8. Ten (23.3%) patients had no predisposing factor for RRD, whereas the most common cause was pseudophakia (13 patients - 30.2%). In the postoperative period, visual acuity (VA) was increased in 20 patients and the initial VA was preserved in 13 patients. In 10 patients, visual acuity was worse than preoperative VA. After removal of the vitreon, the recurrence rate was %39.5. Postoperative anatomical success rate was 60,5%, and functional success rate was 76,7%. The most common postoperative complication was secondary cataract (23,3%).